Such file size limits are set so that the web server space is not exhausted by letting candidates upload any image size as several lakhs or even crores of candidates apply for government exams. Even a photograph taken with smartphones in high quality will be at least 3-4 MB in size. If 3000 candidates apply, it will be roughly 3 GB of photographs! I have had some novice computer users, especially relatives and friends ask me to edit their photos as per the specifications issued in the advertisements. And I have also advised them on free tools they can use to do basic photo editing for such purposes. If you have Adobe Photoshop great! 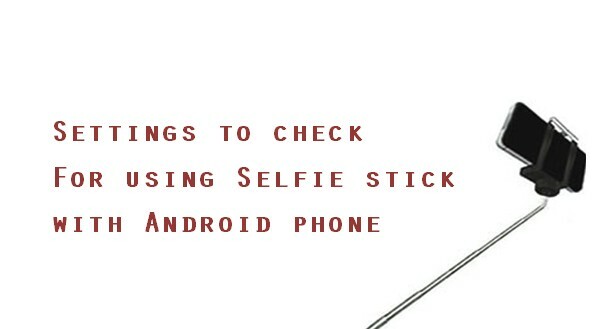 Otherwise, let's see some of those tools which we can use for basic photo editing. What if you are asked to upload passport photos with specific DPI (dots per inches) specification? Example: "The photo should be 3.5 cm x 4.5 cm at 100 DPI". 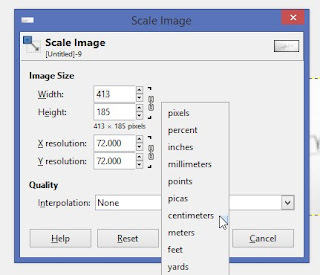 3.5 cm x 4.5 cm photo = 1.38 x 1.77 inches = (1.38x300) x (1.77x300) pixels = 413 x 531 pixels at 300 dpi. Using the above conversion, we can now easily use the tools at our disposal to edit the photographs to upload. I have seen some friends and colleagues using paint to edit photographs. But Paint is actually a drawing program and not a photo editing program. So, the tools in Paint are not good enough for editing photographs. However, you can also use some of the features of paint to do some basic changes. If the aspect ratio is not maintained, you won't be able to resize properly. Paint always maintains the aspect ratio of the image loaded. That means, when you change the width, the height is also changed and vice-versa. If you have a soft copy of a passport photo with proper aspect ratio, then it should not be a problem. Paint.NET is an image and photo editing software for PCs that run Windows and based on the .NET Framework. Originally intended as a free replacement for the Microsoft Paint software that comes with Windows, it has grown into a powerful yet simple image and photo editor tool. Paint.NET depends on Microsoft's .NET Framework 4.6, which is automatically installed if it isn't already on the system. Paint.NET is definitely more advanced than Paint and certainly with more features. Now, regarding the topic, Paint.NET is also recommended for editing photos for uploading to government exams application forms online. Paint.NET has a simple interface for that purpose. First Download and Install Paint.NET if not already installed. Download link given further below. 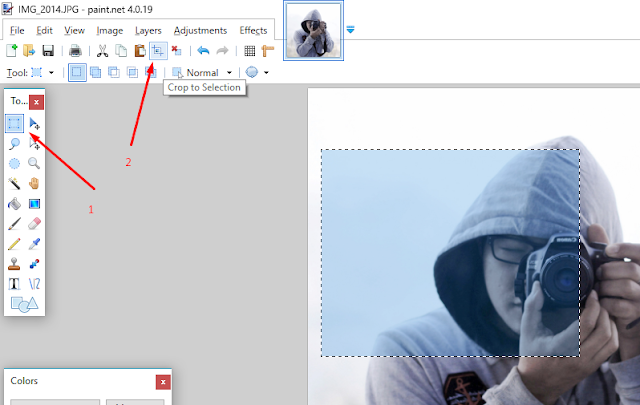 Drag and drop your photo in the Paint.NET work space. When asked whether to open the image or add as a layer, select "Open"
If the orientation of the photo being edited is landscape, crop the photo to select only the required portion of the photo in the passport photo. 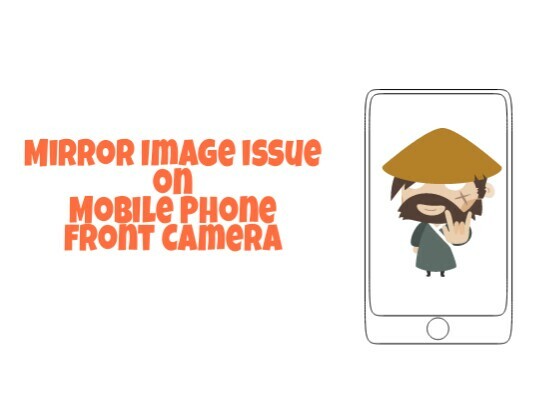 After cropping, you should have a photo in portrait orientation. So the aspect ratio is somewhat close. We now have to adjust the dimensions to fit the size requirements. Click on Image > Resize. 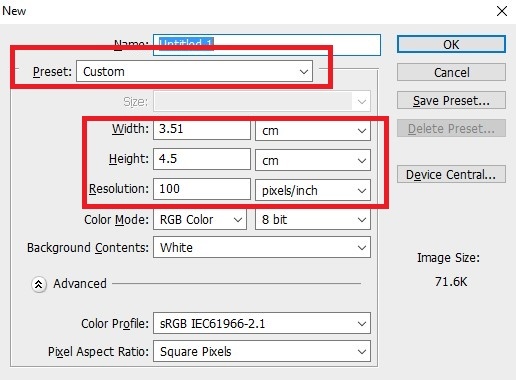 Using Image Resize, you can use absolute size and disable maintain aspect ratio and start editing your image as desired. If the aspect ratio of the image you have cropped is exact, then you may also use "maintain aspect ratio". and see that the file size is within the requirements. In the screenshot above, the adjustment have been made to fit requirement of 3.5x4.5 cm and file size below 40Kb. 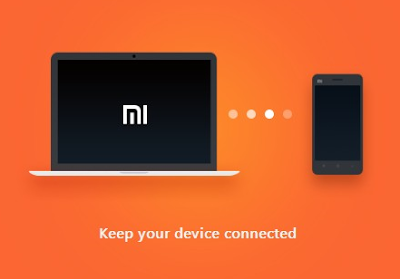 In some cases, dimension may also be mentioned in terms of pixels such as 110px x 140px. If you are someone who is looking for light weight photo editing tool instead of heavy photo editing programs with tons of features which you may probably never use, then Paint.NET is worth checking out. Microsoft Office Picture Manager is a basic photo editing tool and is a part of Microsoft Office Suite. So if you have Microsoft Office prior to MS Office 2013 installed on your computer, then Microsoft Office Picture Manager may already be installed on the computer. Microsoft Office Picture Manager is an easy to use software and is ideal for quick edits. Use the Edit and Picture menus, you can do the following photo edits: Brightness and contrast, Color, Crop, Rotate and flip, Red-eye removal, Resize your picture. Click to open the Microsoft Office folder. Click to open the Microsoft Office Tools folder. Click Microsoft Office Picture Manager. If you cannot locate Microsoft Office Picture Manager from the above steps, navigate to C:\Program Files (x86)\Microsoft Office\Office12" (Office 12 could be different in your case), and find "OIS.exe". Double-Click to open. Press Windows Start button on the keyboard, and then type "OIS". Double Click to open. Do any editing required such as color adjustment, cropping off unnecessary area etc. 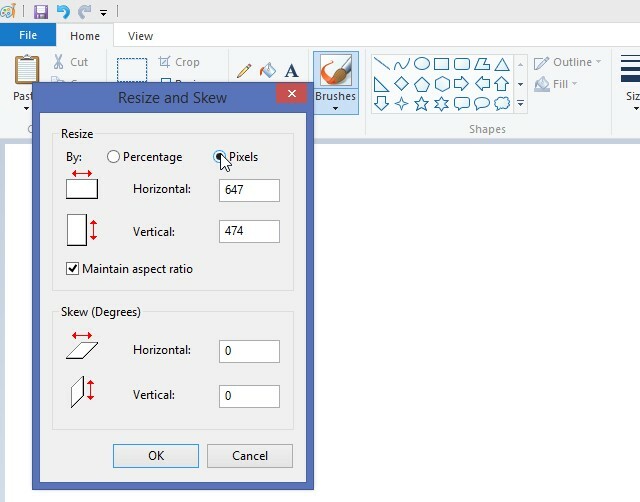 From the right sidebar, click "resize"
Click "Edit Pictures" from the toolbar > use the "Crop" tool to adjust the width or height (whichever you left out in the above step). 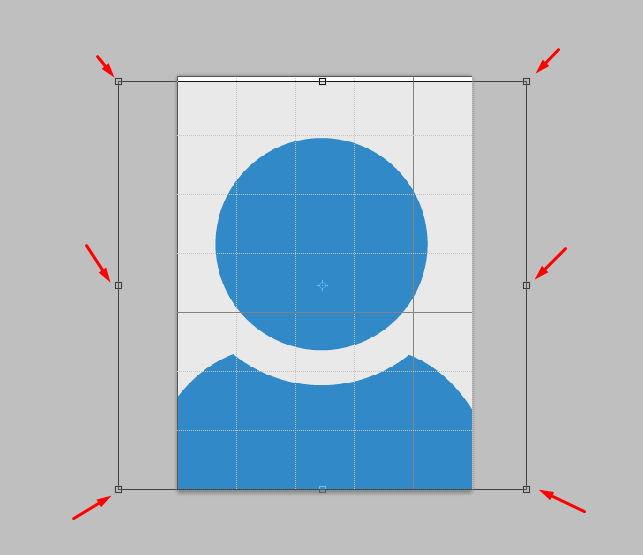 Watch the size on the right sidebar as you crop, till the required dimension is reached. How to get Microsoft Office Picture Manager if you don't have it installed? If you can find OIS.exe in these two directories, then Microsoft Office Picture Manager is installed. Double click on OIS.exe to start. With Microsoft Office Picture Manager you can manage, edit, share, and view your pictures from where you store them on your computer. Unfortunately, Microsoft Office Picture Manager is no longer available in Office Suite starting from Office 2013. 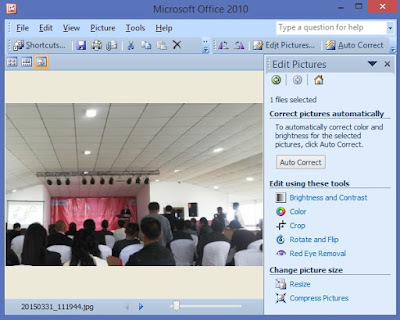 (Find out how to install Microsoft Office Picture Manager with Office 2013). GIMP is a free and open source image editing software. GIMP stands for GNU Image Manipulation Program, for X Windows systems. Most of the features in GIMP are somewhat similar to Photoshop. Menu > Image > Transform: to rotate images etc. Menu > Color : to adjust brightness, contrast, color balance, de-saturate etc. Menu > Tools > Transform Tools: to crop, rotate, move etc. 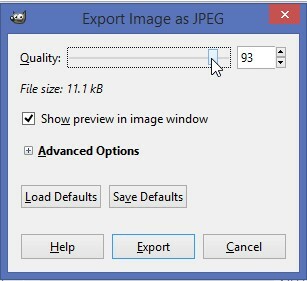 After editing, do "File > Export As" to save the edited image as .jpg or in any other image extension. 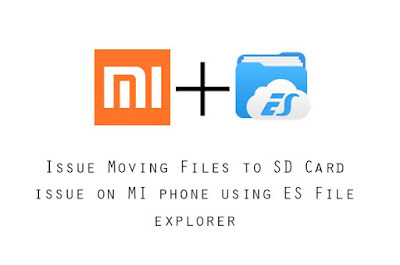 While exporting enable preview to see the file size of the image being exported. This is a handy feature and it helps to bring the size of the image within the specifications. 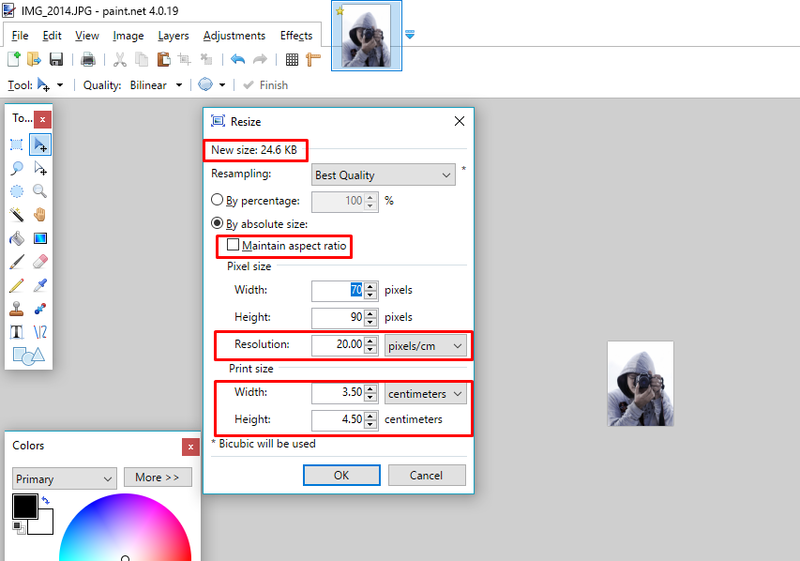 To increase or reduce the file size, adjust the quality of the image by dragging the slider. Adobe Photoshop is not a free tool but it is a great photo editing software. So, I thought of including in the list too. If you have Photoshop installed and are familar with it, then it is very easy with Photoshop. Let's see how to bring down a photograph to 3.5 cm x 4.5 cm at 100 DPI. Open the photo you want to edit. Click on the previous tab where we have the photo to be edited. Make sure the "Move Tool" is selected. 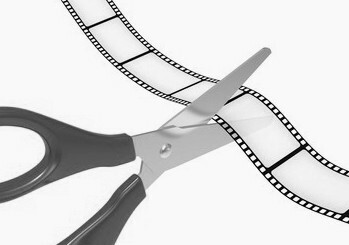 Drag the photo in the first tab with the move tool to the 3.5 x 4.5 cm blank photo we created in step 3 to 7. The image may be way out of scope, but don't worry we will adjust in the next steps. Press CTRL + T on the keyboard to "transform" the photo imported. After you are satisfied with the photo, save it for web (File > save for web & devices) > select quality > see the size of the photo displayed in the preview pane.